Our nursery is located in the Piedmont Triad region of North Carolina. Our wholesale tree nursery in Gibsonville, NC specializes in field-grown B&B ornamental shade trees. In addition, we offer North Carolina Christmas trees grown on our Sparta, North Carolina Christmas tree farm. Following in the footsteps of his grandfather and father, owner Bruce Wagoner attended NC State University and received his BS in Ornamental Horticulture in 1988. 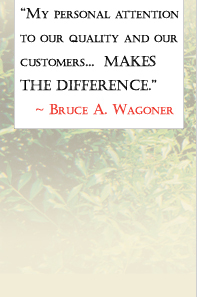 Bruce joined the family North Carolina Christmas tree business in 1989, and in 1990 opened Wagoner's Nursery. Throughout the past 16 years, Wagoner's Nursery wholesale tree nursery has worked diligently to identify and meet the needs of our customers. Our quality and our attention to personal service have consistently set us apart as a result of that focus. We invite you to visit our North Carolina nursery and see the difference.